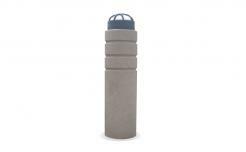 Concrete bollards for sale offered in a wide variety of concrete barriers available in so many bollard security styles, shapes and finish colors. Nobody does it like MARKSTAAR when it comes to custom bollard manufacturer concrete bollard security solutions. Markstaar Security Bollards distribute and manufacture the most comprehensive line of high security, high access control, and decorative bollards in North America. Markstaar Security Bollards, where high security access control - Stops! Markstaar Security offers perimeter high security solutions including security bollards, security gates, entry barriers and high security perimeter fencing.